The Remote for VLC app for iPhone and iPad provides fast reliable control of your VLC device on a Mac OS-X Computer. Remote for VLC app uses your wireless network, so it can be used from any room in your house, or the convenience of your arm chair. The large buttons are easy to find on the table, and you can adjust the button sensitivity to avoid accidental taps as you fumble for your phone in between the beer and peanuts. Large buttons mean you won't accidentally tap the wrong button, loosing your place in the movie. A single tap gets you commonly used actions. Swipe buttons up, down, left or right for less used functions. The help screen explains the functionality of each button in full. Fast forward and slow forward operations. Step forwards and backwards by a frame at a time. Zoom in and out of full screen. Optional password protection, to stop the kids taking over. Please see the help page on the app for details on each button's operation. Most buttons have additional functions obtained by swiping in different directions. 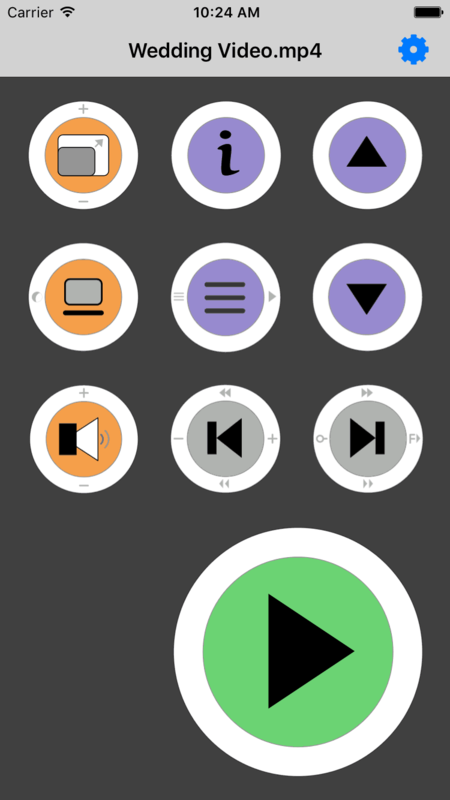 Install the Remote for VLC App onto your iPhone or iPad. Download the JazzRemoteServer package and open it on the computer you wish to control (ie. the computer with the VLC Media Player software). It installs the server software and a System Preference Panel to control the server. Check that the server has been started from the System Preferences Panel. Basic functionality works out of the box. Advanced functionality requires a one-time VLC setup. The app will guide you through setup when required (or you can find instructions through the app's help menu). v1.0.1 extends the program history (when available) and fixes a bug which caused the Preference Panel to sometimes crash when loading. v1.0.2 fixes an issue where the channel list shows as empty. v1.0.4 fixes an issue where EyeTV would launch unexpectedly, with sound only. v1.0.5 adds compatibility with the Volume Remote app. v1.0.6 Fixed an issue where the server wasn't automatically started after installation. Attempting to view a new channel while recording in EyeTV now opens a new device window if available. v1.0.7 This release adds Remote for VLC support. No other changes in this release. v1.1.0 This release adds Remote for YouTube support. No other changes in this release. v1.1.2 Stability improvements for High Sierra, where JazzServer would occasionally need restarting. v1.1.3 Fixed an issue with Remote for YouTube where YouTube videos would sometimes fail to seek to new locations. v1.1.5 Fixed an issue where Jazz Remote Server could fail to start for macOS 10.10 and earlier. Minor updates to maintain future compatibility. ©2017-2019 Jazz Media Pty Ltd. This project is not affiliated with VideoLAN. VLC and VLC media player are trademarks of VideoLAN. * The software has been tested against VLC 2.2.4. It may work with earlier versions.